For live help, you can join our chat and post in the #help channel. Please share a detailed message with the issue you are experiencing. LBRY log files are a good source of information for us; you can learn how to find them here. You can also email LBRY with questions or issues. 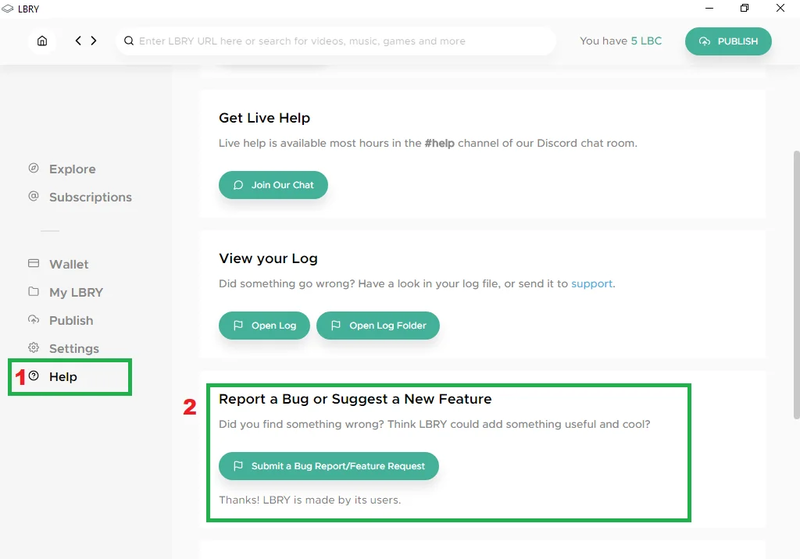 LBRY log files will help us better understand the issue you are experiencing, you can learn how to find them here and attach with your email. Send us an email to help@lbry.com with the details of your issue or bug report. If it's troubleshooting related, please attach your LBRY log file. Go to the "Help" page of the app and then click the "Submit a Bug Report" button. If you're a developer or otherwise technical and want to interact with LBRY developers directly, you're welcome to open an issue directly on GitHub. Please try to open network or protocol related issues here and interface, usability, and other application related issues here. The penalty for getting this wrong is a mild shaming. We would appreciate a quick search to see if similar issues already exist, as well.